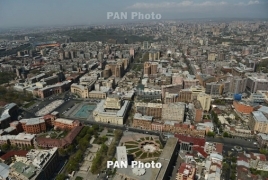 PanARMENIAN.Net - Armenia aspires to be the Silicon Valley of the South Caucasus, Eurasianet.org says in an article about the country's achievements in the tech industry, focusing on a smart crib unveiled just recently. Presented to the public in Yerevan last week, the smart bed called Cribby looks something like a futuristic Moses basket. With a frame handcrafted from wood, the bed is equipped with a camera, scales, movement censor and cloud storage for phone photos. It is also a bit of a lullaby jukebox. If the baby starts crying, the bed’s music player can automatically start playing one of the songs from its vast selection of lullabies from around the world. It can all be operated from a distance, using smartphone apps. "Armenia’s ever-imaginative, ever-expanding high-tech sector has produced other technological curiosities as well, such as locally designed smartphones and tablet computers – a post-Soviet first it shares with Russia," the article says. "The small, landlocked nation clearly aspires to be the Silicon Valley of the South Caucasus. Its government prioritizes information technology with measures like tax breaks and educational programs, and seeks to promote collaboration between local and international tech companies."